We would like to inform you that an Andorra passport holder has to apply for a Vietnam visa before entering Vietnam. At the present, there is no Vietnam embassy in Andorra. If you want to get your Vietnam visa from a Embassy, please check other countries to find the nearest Vietnam Embassy/Consulate to contact. In case it’s not convenient for you to come in person to a Vietnam embassy, applying for a Vietnam visa by post is recommended. However, please contact the embassy in advance to check whether you can obtain a Vietnam visa by post or not. 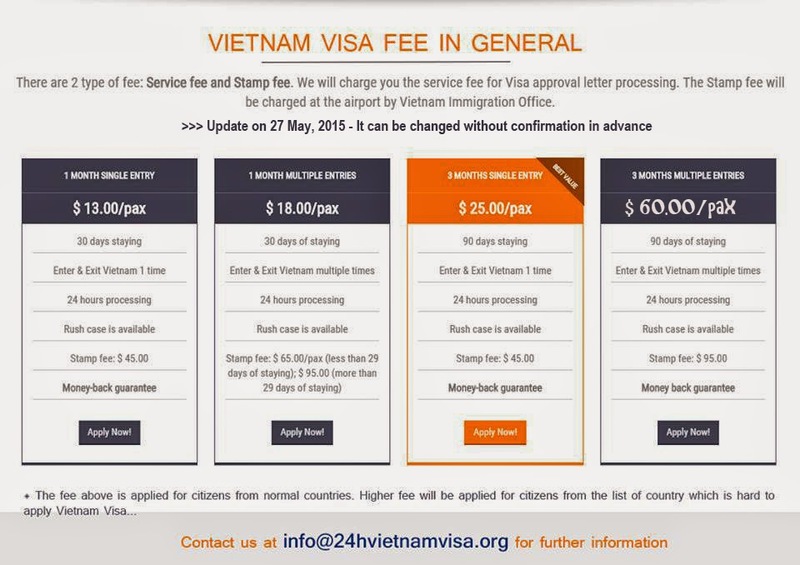 with validity less than 5 days then visa holders must depart to a third country after 5 days in Vietnam at maximum. You will be granted a transit visa on the condition that you travel by tour and the group must have clear schedule and indemnify of a travel agency that organizes the tour. - Access our website gettingvietnamvisa.com to fill in the online application form. As there is no Vietnam Embassy in your country, it seems so inconvenient for you to obtain your visa using this way. We highly suggest you to apply online to obtain an approval letter to pick up your Vietnam visa on arrival at Vietnam international airports to save your valuable time and money. In some cases, you can apply for a 3 month visa for tourism purpose; the procedure will be the same with 1 month visa. In other words, Vietnamese tourist visa's validity can be from 15 days to 3 months. 1/ Getting Vietnam Visa-On-Arrival (recommended): Pick up at the immigration checkpoint in Vietnam international airports. This is a quicker and easier way than the other, you can have the Approval letter within 2 days or even 8 working hours or 4 working hours. You can ask any Travel agent in Vietnam or refer to us by clicking online application form then we will arrange your Approved letter, this letter used to get onboard and together with your passport and 2 photos to get your visa stamped at Vietnam airport. 2/ Getting Vietnam visa at Vietnam Embassy: Before coming to Vietnam. You can contact Vietnam embassy directly for applying Vietnam visa, or get your visa stamped at embassy with pre-approved letter with code (Vietnam Embassy Visa) to pick up Vietnam visa stamp at embassy from Vietnam Immigration Department. - No visa required for travel less than 30 days: Citizens of Thailand, Philippines, Malaysia, Singapore, Indonesia and Laos. - No visa required for travel less than 15 days: Citizens of Japan and South Korea, Sweden, Norway, Denmark, Finland and Russia. - No visa required for travel less than 90 days or several visits within 6 months: Citizens of France holding valid diplomatic or official passports- No visa required for travel less than 60 days: Citizens of [updating] holding valid diplomatic or official passports. - No visa required for travel less than 60 days: APEC Business Travel Card (ABTC) Holders from Asia-Pacific Economic Cooperation (APEC) member economies. Student visas: A student visa is usually arranged after your arrival. It's acceptable to enter Vietnam on a tourist visa, enrol in a Vietnamese language course and then apply at the immigration police for a change in status. In reality, the easiest way to do it is to contact a travel company and have them help you make the application. Vietnam has signed agreements on Vietnam visa exemption with 55 countries (56 agreements), of which 54 agreements has entered into effect while 2 agreements has not been in force. The Exemption of visa includes exemption of visa for entry, exit and transit. The duration of stay subject to visa exemption begins from the date of entry. 1. Officials and staff of ASEAN Secretariat are exempted from visa by Vietnam with the stay duration not exceeding 30 days, whether they bear any passports. • They are not in the list of persons not permitted to enter Vietnam.